Donning a pair of skis or a snowboard and heading off-piste is not the only way to discover untouched terrain on the mountain. With a pair of snowshoes strapped to your feet and the help of a knowledgeable local guide, you’ll be amazed at the places you will find. If you’re not sure what snowshoes are, they’re the lightweight contraptions, referred to as ‘raquettes’ by French locals due to the original wooden designs resembling the shape of a tennis racket, which you attach to your walking boots to distribute your weight and provide you with extra support when walking in deep snow. Unfortunately as skiers often only see snowshoers striding around resorts (yes these useful contraptions are also a regular means of safe transport for getting from ‘A’ to ‘B’ on hazardous snow and ice covered trails that motorized vehicles can’t access), the sport doesn’t have a reputation as being the most exciting of winter pastimes. But don’t be fooled, real snowshoe trekking is highly energetic burning around 700 calories an hour, and the hard work is well rewarded by access to incredible parts of the mountain where you won’t see a ski lift or crowd in sight. As you explore fields of knee-deep powder, trek through Narnia-like forests and climb up above the clouds to admire uninterrupted views of the snow-capped peaks, you’ll feel like the only people on the mountain. Our guide Bruno has been in the business of mountain guiding in Samoens for years and knows a thing or two about where to take trekkers to ensure everyone in the group has a day worth writing home about. That’s why we are chuffed to have Bruno lead our snowshoeing week each year. We know he’ll take you to the most amazing lunch spots, uncovering wild animals including marmots, deer, chamois and various birds of prey on the way, and choose the best routes for the experience and fitness levels of the group as well as the conditions. Expect to come home feeling invigorated with an amazing photo album to share with your friends and family. 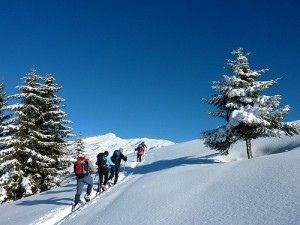 We organise just one snowshoeing week a year and this season it runs from Sunday 22 – 29 March. Guests will stay in our beautiful chalet La Grande Ourse and will be well fuelled for their daily treks with a hearty breakfast, generous picnic lunch, afternoon tea and a three course evening meal. You’ll also get to warm up by the chalet’s log fire and soak tired muscles in the hot tub. 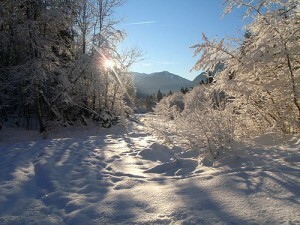 The cost is £715.00 (7 nights) per person based on two people sharing and includes equipment (a lift pass is not needed). So whether you’re a summer hiker looking to try something different or a skier keen to experience a more tranquil side of the mountain, we hope you’ll be tempted to make fresh tracks snowshoeing with us this year.